TootsieToy made half scale dollhouse furniture made in the 1920s-1930s. The oldest pieces have no moving parts. The furniture was made of metal, which would make it appear durable, however the pieces were prone to bends and breaks and the paint chipped. I've been collecting these little pieces since my dear friend Patty gave me enough furniture to fill an entire house. Usually, I don't refinish antique pieces, but since these are often found in poor condition, I do make an exception. I remove the old paint if it's been repainted and clumpy, or if it is badly chipped. If it has a fair finish and is not so thick as to cover up details in the little pieces, I just paint over it. I use a Q-tip & nail polish, but you have to be careful, you can smooth down the details if you are too vigorous. I've use a course emery board to smoother down paint chips and edges. Sometimes people spray paint these pieces, which can keep little doors from opening. I use a small brush and acrylic paint, trying not to fuse doors & drawers together. When finished I spray everything with a clear matt sealer, again being careful not to fuse together doors and drawers. Don't immerse the pieces in the nail polish remover, it removes some of the metal. Be careful sanding these prices as they were manufactured before lead precautions. I don't know if there is any type of risk, I just wouldn't take chances. 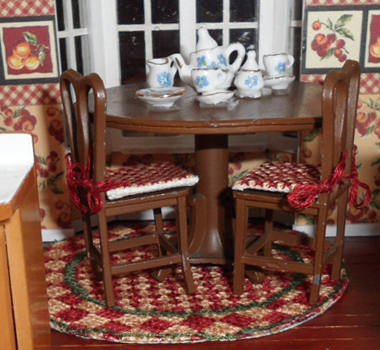 This dining room table is one of the older TootsieToy pieces. The paint appears to be original. 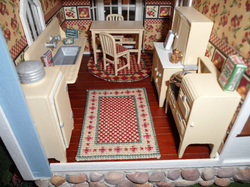 Some of the TootsieToy accessories were large enough to fit in a one-inch scale house. This telephone has had the dial repainted. 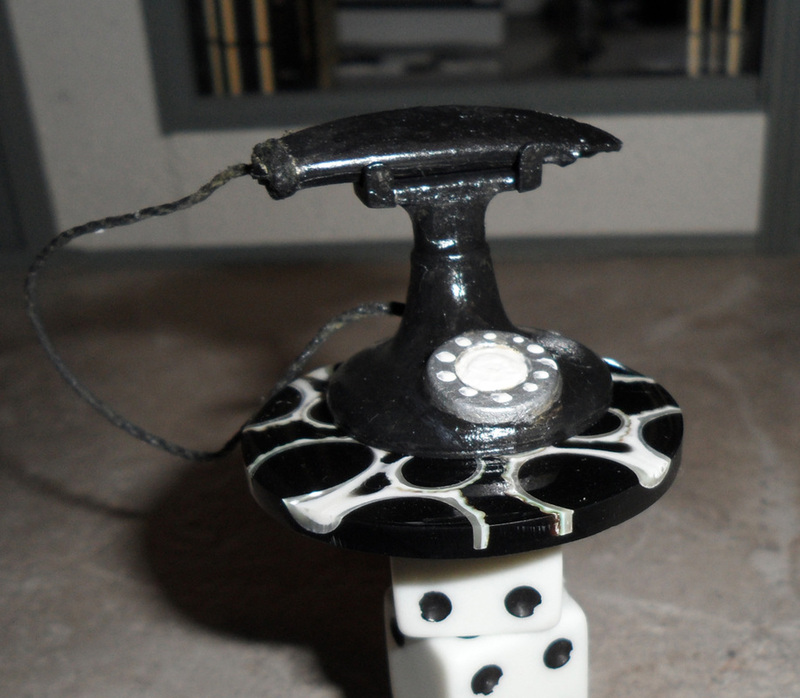 The phone resides in a modern dollhouse sitting on a side table made of dice. 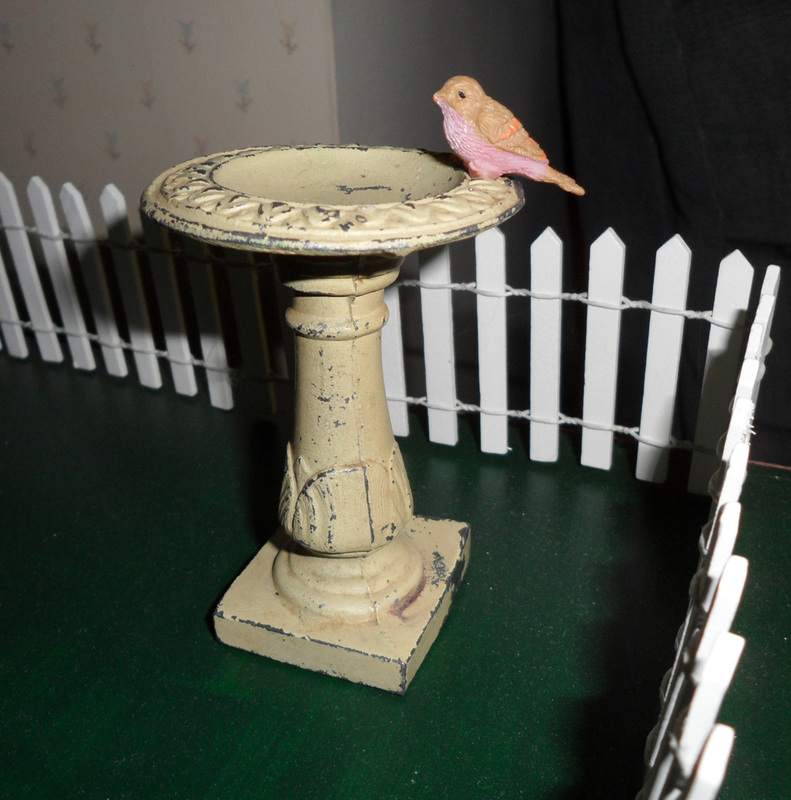 The birdbath is another TootiseToy piece that is in one-inch scale. The birdbath's paint is original. The little bird has been added.